Do You Remember These Social Media Events? Because it is fun and often revealing to look back into history, the following is a brief look at some interesting Social Media milestones. If you have other milestones not included in this lineup, via Mashable’s “The History of Social Media (InfoGraphic)”, give us a shout. Here are some that stood out. How many people know this fact? We never thought it was this early in our evolution. Do you remember this social network? It was definitely a precursor of things to come in the Dot.Com meltdown. Social Matrix: Is It Really This Big? 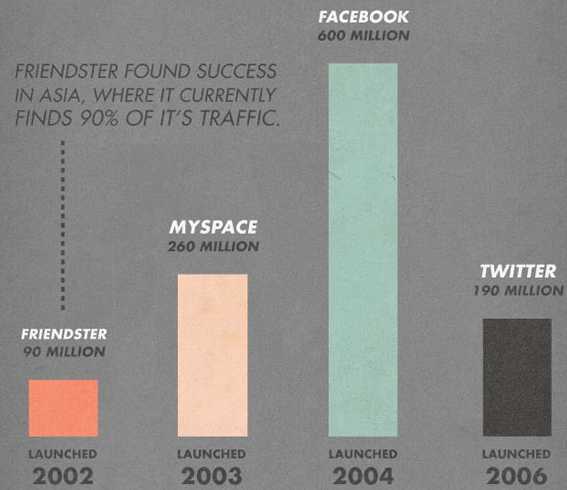 Friendster the grandfather of all social networks is still alive and well? It is interesting that few bloggers challenge the registered user statistics for all social networks. Twitter, a micro-blogging site, most likely mirrors blog attrition numbers yet nobody challenges them. Of the 190M+ registered users on Twitter, how many accounts are abandoned, run by bots, or the product of single users establishing multiple accounts? The same question for Facebook could reveal a much lower number of actual users. As we continue to see growth and adoption, what is the relevance of true registered user numbers in understanding the impact of each network? Only time will tell how far we have actually evolved. How Do You Recognize Your Evangelists? Johnny Carson’s Carnac the Magnificent could not have framed it better: “Social Media, Bruce Lee, the UFC. . . What’s a revolution, an institution, and a evolution.” Social Media is the revolutionary byproduct of Web 2.0 and blogging. It is a collaborative paradigm shift in communication and connectivity characterized, by Tim O’Reilly, as an “architecture of participation.” Yet what does it have in common with Mixed Martial Arts of the UFC and martial arts legend Bruce Lee? A: Connectivity and evolution. Bruce Lee description of his fighting philosophy: “Be formless… shapeless, like water. If you put water into a cup, it becomes the cup. You put water into a bottle; it becomes the bottle. You put it into a teapot; it becomes the teapot. Water can flow, or it can crash. Be water, my friend…” It was Bruce Lee’s creation of Jeet Kune Do that was the roots of Mixed Martial Arts. Jeet Kune Do relies upon multiple (mixed) styles no one more important than the other. Lee’s philosophy was that the opponent and circumstances dictated which discipline within Jeet Kune Do be used against an opponent. It is not fixed or rigidly patterned like traditional martial arts but rather it is a philosophy with guiding thoughts. Nearly 40 years later, the UFC represents the evolution of Jeet Kune Do by becoming the fastest growing sport on the planet. Like Bruce Lee’s role in the creation of mixed martial arts, blogging is the forefather or foundation on which Social Media was built. The connectivity that blogging brought to the masses is the basis for the Web 2.0 revolution that ushered in our current era where individuals have the power to create brands, mass media styled messages, and connect on a world wide basis with their targeted audience(s). Chris Brogan’s latest post “How Hotels Can Win More Business Travel” is a look at how all social media marketers, social media consultants, entrepreneurs, and large companies should be looking at applying social media networks to their challenges. Implementing new processes in order to meet a business challenge is often a matter of observing and re-engineering. In Chris’s post, search is the main tool with an open mind to possibilities. Let’s take a look at 3 of Chris’s steps. 1. Get Aggressive with Search: Chris utilized a Twitter search that found conversations surrounding lodging in Austin, Texas for the SXSW conference. He found folks who were having a problem finding accommodations. Chris’s idea: “If I were an Austin, TX hotel property with open beds, I’d go after each and every one of them with a rate quote and an easy link to make the reservation. 2. Improve Your Concierge Service: Chris’s idea here is simple yet few are doing it. He talks about chronicling and then databasing a travelers tendancies, wants, and needs. “How hard would it be to database your guests a little bit, and start to understand their recurring business travel needs? How difficult would it be to share them across properties? Restaurant’s Strategy: (dg) Like inventory control when chef’s order their supplies, a customer’s preferences for dishes would be a database that could be very impressive to both local and business travelers. With these tendencies, a restaurant could Tweet specials, special nights, or offers with confidence. Create a database of your customers. Real Strategy to Connect: At the restaurant location, offer them the opportunity to actually login and sign up to be your fan on Facebook and connect on Twitter. This is the next generation version of those stale paper “How Did We Do” evaluation forms so many restaurants use. Restaurant’s Strategy: Due to the economic crisis we all face, eating out today is often a luxury for most people. Restaurant’s should consider leveraging their food as a commodity by offering special value items, menus, or incentives. Granted many restaurants offer value but do they do this strategically? Often the value offer is something that is seen as less value and more fluff. The free dessert, apertif, or side dish just isn’t going to get it in today’s world. Restaurants must give something their customers actually want and give it to them with the idea that they can make up the costs in return visits, alcohol sales, and viral marketing word of mouth. Trend Micro discovered the new strain and is busy at work on a solution. For more information go to Trend Micro’s Malware Blog “New Variant of Koobface Worm Spreading on Facebook.” Same old story with terrible results. Don’t open anything that resembles a video file, investigate the orgins of messages sent to you on Facebook, and make sure you understand the consequences if you decide to open these messages.